Abbracci Italian Hugs Cookies are made with a buttery crunchy vanilla and chocolate cookie, that wrap around each other in a hug. Therefore Abbracci or Hugs. Fun to make and even better to eat. When I first came to Italy I was obsessed with these crunchy, buttery cookies. 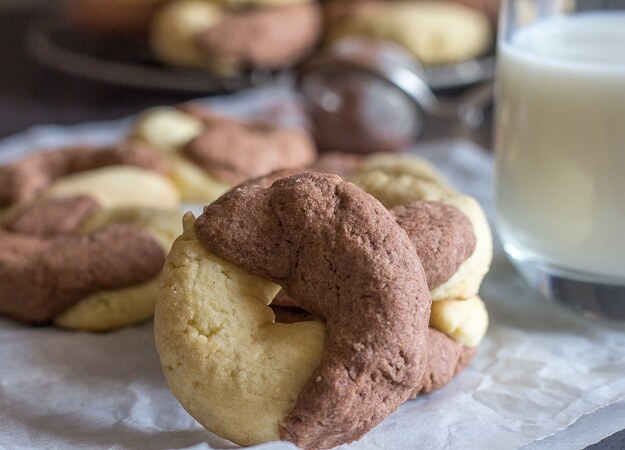 It seemed all the best cookies were made by Mulino Bianco and I wanted to try them all. Back then my husband’s favourite dessert was my Mom’s No Bake Pineapple Cream Dessert and he said I just had to make it for his family. Easier said then done. There were no digestive cookies or graham cracker crumbs, so I used the next best thing. One of my favourite Mulino Bianco cookies, which I ground into crumbs. Back then even the easiest recipe would take me longer than usual from chopping chocolate in order to make chocolate chip cookies (yeah no chocolate chips back then), to trying to figure out a good substitute for one thing or another. Those were the days! So much easier now. And the baking I do! 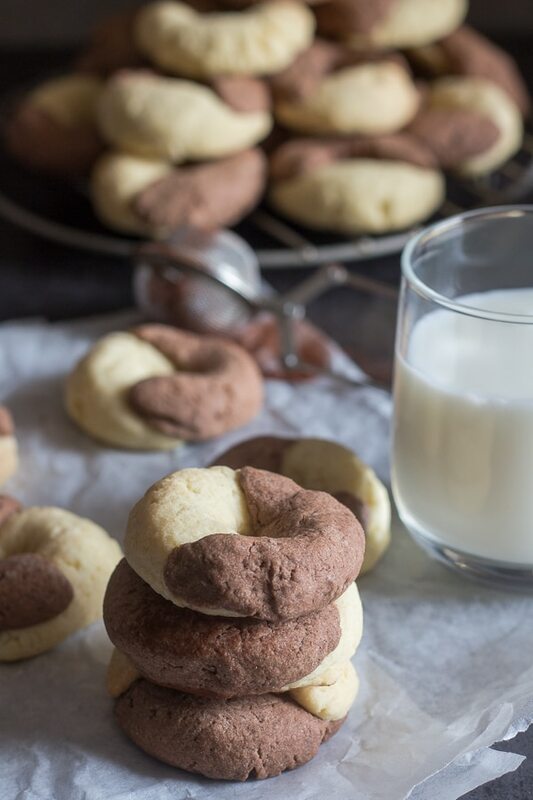 Including these Italian Abbracci Cookies, these are the perfect snack or even one of the best dunkers with your morning coffee or caffe latte. 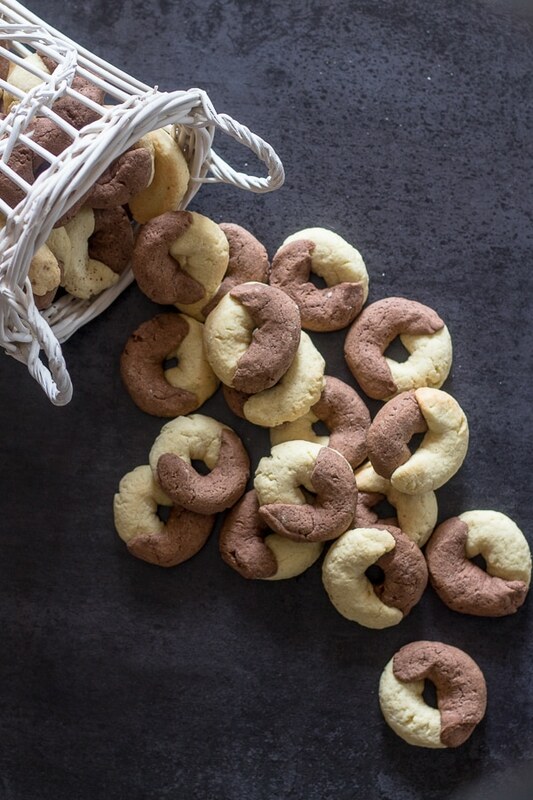 More Italian Cookies you may Enjoy! Beat butter and sugar until creamy, then add the egg and vanilla. Add the flour, cornstarch and cocoa for the chocolate dough and just the flour and cornstarch for the vanilla dough. Gently knead the dough until smooth. Wrap both doughs, in plastic wrap and refrigerate for 60 minutes. 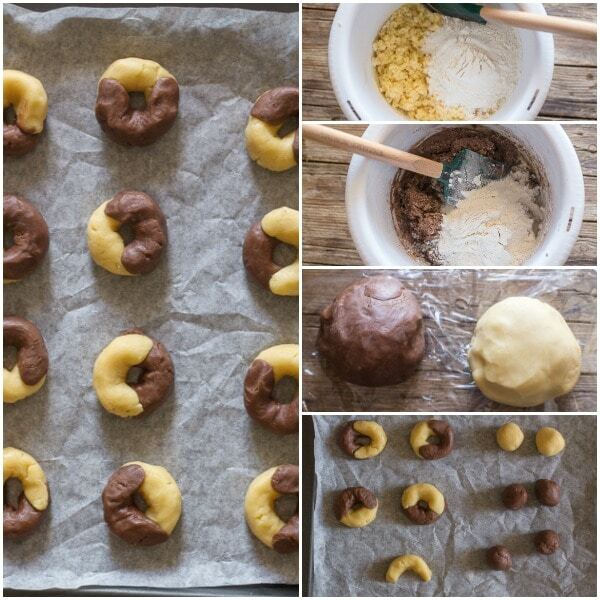 Remove the dough from the fridge and take pieces of dough, and roll into balls as close to the same size as possible. Then roll into approximately 2 1/4 inch ropes. Wrap the ends of the chocolate rope over the vanilla rope and press gently making sure the ends stick. Place the cookies on parchment paper lined cookie sheets and bake for about 15 minutes. Let cool completely before enjoying. A few weeks ago was a big holiday here in Italy, May 1, the equivalent to Labour Day in Canada and the USA. I made these cookies and another dessert to take to share with friends. I laughed when I heard everyone shout out “Abbracci!” I not only loved the taste of these Hugs Cookies but also the wonderful idea of the chocolate and vanilla wrapping themselves around each other in a hug. The perfect cookie when you need a hug or a delicious gift idea for someone you know who needs a hug! Enjoy. In a small bowl sift together the flour and cornstarch. In a large bowl on medium speed cream butter and sugar until combined, then add the egg and vanilla and beat to combine, then beat in a third of the sifted flour mixture, add the remain flour but combine with a wooden spoon or spatula until almost combined. Move the dough to a lightly floured flat surface and gently knead until smooth. Wrap in plastic and refrigerate 1 hour. 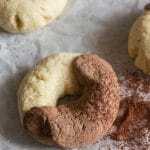 In a small bowl sift together the flour, cornstarch and cocoa. Remove the dough from the fridge. Taking small pieces of dough** (either vanilla or chocolate) make small balls (between a marble and a golf ball) then roll into 2 1/4 inch chunky ropes, wrap a chocolate rope around the vanilla rope (or vice versa), gently press down so that the dough sticks. Place on parchment paper lined cookie sheets, and refrigerate for 30 minutes. Pre-heat oven to 375 F (190 C). Bake cookies in pre-heated oven for approximately 15 minutes or until lightly golden. Let cool completely before serving. ** I rolled and made the cookies with 1/3 of the dough at a time. Conserve in a air tight container for up to 2 weeks or freeze. Can you help me. We just spent two hours trying to trying to roll and shape these cookies. They are very crumbly and dry. Help !!!! Hi Cindi, if the dough is too dry, then add more butter (a tablespoon at a time) until it comes together. Let me know. 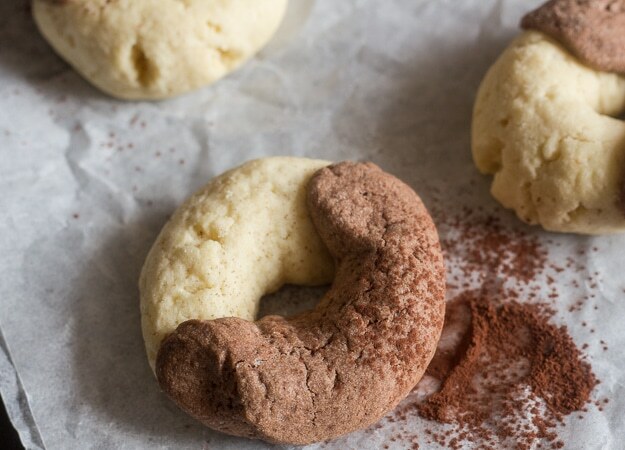 I just made these Abbracci Italian hugs cookies and they’re delicious! I will definitely make these again. Hi Gina, thanks so much, so glad you enjoy them. Have a great weekend.